A Fluid Bed Dryer is designed for fast and uniform drying of powders, crystals and medium sized pellets. 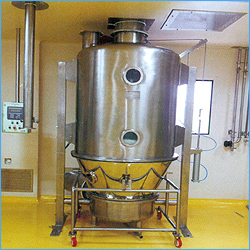 The Fluid Bed Dryer finds application in Pharmaceuticals, Bulk Drugs, Dyes & Chemicals, Phyto-Chemicals, Catalysts, Food Products & Starch derivatives, Pesticides etc. Fresh air is drawn in by means of a fan. The air is then passed through a filter and heated to produce warm air by use of electric heaters. If the product contains a solvent or inflammable substances, the dryer must be operated using steam and provided with a flame-proof motor. The heated air passes through the product container which has diffuser plates and a sieve. Due to the stream of air, the wet product gets fluidised. The material gets surrounded by the hot air and gets dried due to heat transfer. Moist air passes through a filter bag and an exhaust duct. 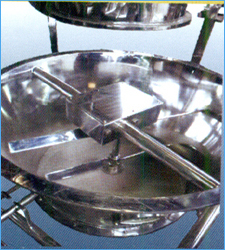 The Fluid Bed Dryer is not suitable for drying of liquids or pastes. We are among the most trusted firms, engaged in manufacturing, supplying and exporting Fluid Bed Dryer Machine. Designed in compliance with international quality norms, these products are manufactured using quality components and material, procured from the reliable vendors of the market. We also have R&D experts who conduct regular researches to improvise our Fluid Bed Dryer Machine. In a Fluid Bed Dryer, the temperature is distributed uniformly throughout the product and the heat rate is very high. High production rates are achieved because of reduced drying time. As the product is in close contact with the drying air at a low temperature and for a short duration, the physical and chemical properties of the product are not affected generally and hence the dryer can be effectively used in the case of heat-sensitive products. As the product is continuously moving during the drying process, there is minimal lump formation or case hardening.